Overkill with the mooncakes? Maybe, but I’m on a roll here. Made strawberry-flavoured snowskin mooncakes with 2 different fillings – rum truffle and coffee tonight in just 1 1/2 hrs. I used the same recipe from my previous post with some tweaks; instead of cold water, I pureed some strawberries and mixed it with some ice cream soda. I read somewhere that using ice cream soda lets the snowskin stay soft and supple for longer. We shall see. I also attempted to make my own lotus seed paste, but that was an ultimate fail. Spoiled one batch by putting in too much baking soda (you do not double the amount of baking soda even though you doubled the amount of lotus seeds!) and it became a alkaliney smelling icky mess. Threw that out, was more successful in my 2nd attempt, but it stayed white and tasted nothing like lotus seed paste. Double fail. But oh well, I can always buy the paste. We bought a stamp mould and used it today instead of the traditional mould and it is so much easier to use! No more waking up the neighbours with the whacking of the mould against the table to get the mooncake out. AND, the impressions are so much clearer. Love it. My conclusion after these 2 days of mooncake making? Never buying anymore mooncakes. 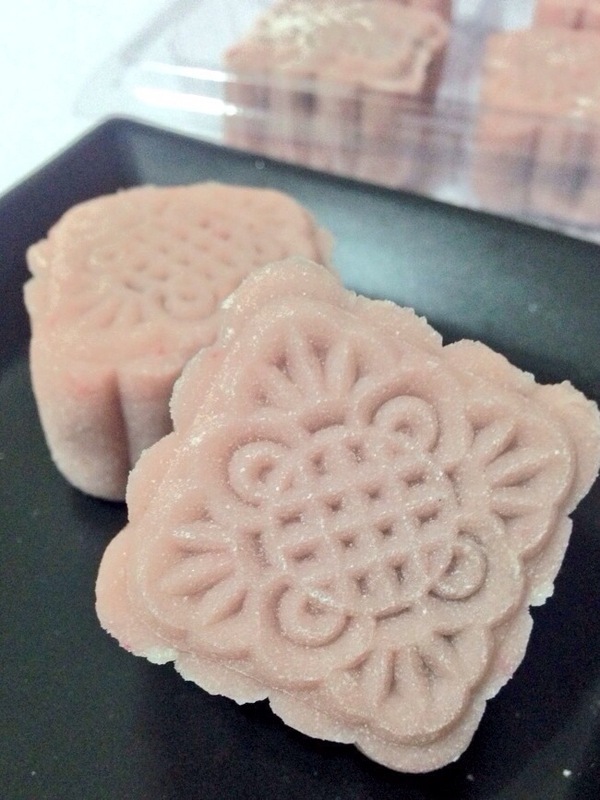 Next Post Last Mooncake Post – Happy Mid-Autumn Festival!